For many, the pursuit of happiness means one thing — the pursuit of wealth. After all, isn’t that the American dream? We want to be better off financially than the previous generation was. We want to have a house that is paid for, two cars, 3.2 kids, a dog, and a flat screen TV. But there is a question that needs to be asked. Just because that is the “American Dream”, is it necessarily God’s dream for us? We need to examine what the Bible says about this dream, and see if it lines up with what God desires for us. And while there is nothing inherently sinful about having money, it does come with some serious warnings. Like fire, it can be beneficial, but used in the wrong context, it can kill and destroy us and those we love. There are two dangers, from what I can see, in pursuing wealth — idolatry and covetousness. But there are also two remedies — contentment and gratitude. Lets see what the Bible says about it. Want to get ahead, and have great gain in life? Great! There is your key to success — godliness and contentment. The Greek word for contentment here indicates satisfaction with what one has. The Stoic philosophers liked contentment because it indicated self sufficiency. But for the Christian, contentment reflects Christ’s sufficiency. We are secure in the knowledge that as we seek first the kingdom of God, and His righteousness, (Matthew 6;33), that our God will supply all our needs according to His riches in glory (Philippians 4:19). Our lives are completely in His hands, and contentment reflects a trust that God knows what He is doing. But some folks are driven no constantly attain more and gather up wealth for themselves. What follows is that money, which is supposed to be a useful servant, becomes a tyrannical master. Eventually, money, or mammon, becomes our God. We think about new wealth strategies day and night and constantly need to have the latest and greatest. Money becomes an idol. You see, Jesus didn’t say it was difficult to serve God and money. He didn’t even say it requires great skill. He said it is impossible! Knowing that, why would any of us mock God and act as though Jesus was mistaken on this point? So how do you know if you have crossed over into the pursuit of mammon instead of the worship of God? Well, what would happen if God took it all away? Or better yet, if He told you to give it all away? Could you release it, since it belongs to Him anyway? Those are hard questions that deserve much thought and self examination. Please don’t go over them lightly. 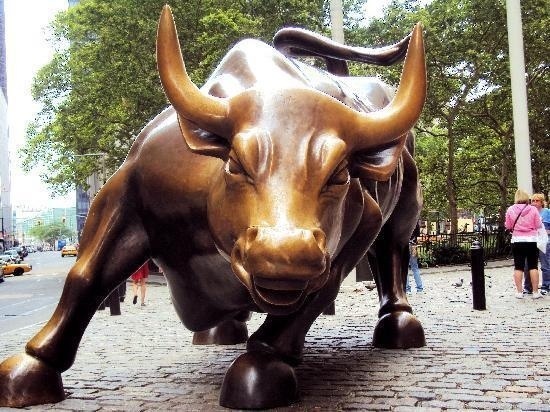 Down in the financial district around Wall Street in New York City, there is a large metal statue of a running bull. For some, it would symbolize a profitable, or “bull” market. In one way, perhaps unintentionally, that state is a warning to those who would worship wealth. Just like the golden calf that the Israelites built at Mount Sinai was an idol that caused death and destruction of lives, covetousness changes money into an idol that destroys us spiritually. And like the bull statue illustrates, it will turn on us without mercy and run us over and leave us behind. If you have wealth, make sure you are also rich toward God, willing to share, and eager to serve God, not mammon. Are you poor? Don’t think that covetousness cannot consume you as well. Rest in God, and trust in His loving care for you. Serve Him fully, and with an eye single to His glory. Walk in godliness.